As tornado season approaches, businesses are gearing up to protect their building assets as well as shield their customers from damaging effects of flying glass. Tornado season varies depending on which area of the United States you are located. In the U.S., tornado season tends to move northward from late winter to mid-summer. In Southern states, tornado season is typically from March to May. In the Southern Plains, it lasts from May to early June. 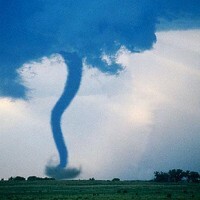 On the Gulf Coast, tornadoes occur most often during the spring. And in the Northern Plains, Northern states and upper Midwest, peak season is in June or July. Last year, when the tornado hit Joplin, Missouri. Saint Johns Regional Hospital patients and buildings suffered. All the windows on the buildings were blown out, and in the process, injuring the patients of the hospital. With increased dangers of severe and non-normal weather as climate change progresses, Christi Hospital of Pittsburgh chooses to be prepared for future tornadoes by installing by installing protective film on all its windows. The protective film fractions of an inch thick, yet keeps glass from shattering and flying in the face of not just tornado force winds, but also debris flying at tornado force speeds. “It’s like hanging a piece of sheet metal on the glass,” Wocca said. The hospital is installing the coating on 88 corridor windows as well as the five labor and delivery rooms on the hospital’s new third floor women’s center. Public relations director Michael Hayslip sad hospital administration decided to contract the $54,000 project after the May 22 tornado destroyed much of Joplin, Mo., and St. John’s Hospital. Congratulations to Hanita Coatings for winning this project.